Education as national, personal priority? Since education is seen as a privilege and not a right in the minds of many, if not most, Haitians of all classes, our team was not surprised when very few people in the study sample mentioned education, public school, as a national priority, or a personal priority. That is to say, people in the sample cited jobs, shelter/housing, roads and security as priorities more frequently than education. Although there is lip-service paid to the importance of mass education, the political class has not quite got the notion that it might be useful to have an educated citizenry - that education is a form of socialization, even mobilization, of a population. Indeed, there were complaints about the flood of rural migrants to the capital; mention was that the paysan should remain on their land andeyo, in the mountains "where they belonged." No, not a universal view, to be sure, but a few mentioned and shared with the researchers. The elitism surrounding education strikes me as a carryover from 18th and early 19th century Europe colonialism. In this respect, much of Haiti -bourgeois, elite and paysan mentalities - remains stuck in 1804. Costs. We asked our sample about the cost of education. There is very little government-subsidized education – what we would call “public” education – in Haiti. What public schooling there was, and is, is mostly in the capital. Small wonder that students are dispatched to Port au Prince! And, to get into such government schools is traditionally very competitive. We were told by many about how, although schooling might be free, getting in was a matter of bribes. The same was said of private schools, good private schools. Palms were crossed, favors tallied. Although historically limited to Port au Prince, last year, prior to the EQ, one such government-support high school has opened in an adjacent mountain zone, in fact. This was following a good deal of pressure from Diasporan relatives, with families in that area. 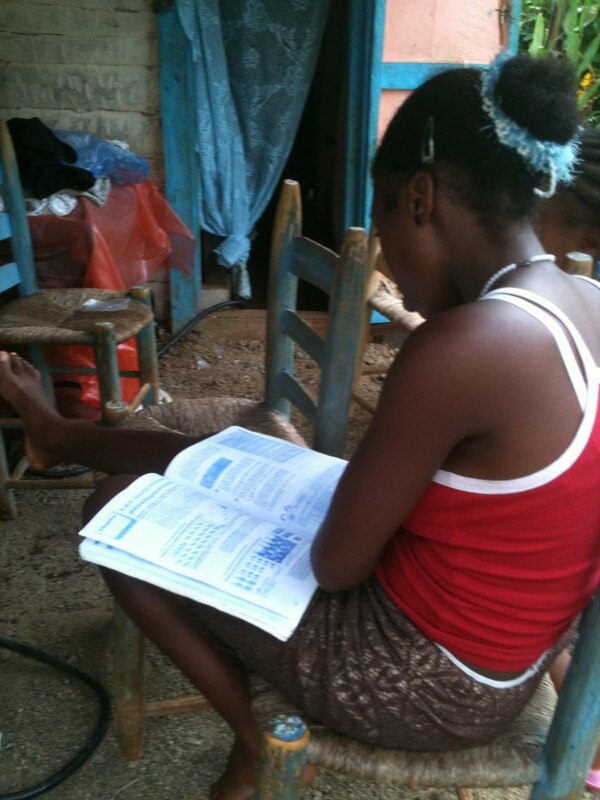 Public or private, education is generally regarded as a privilege, not a right, in Haiti. Some rural families, indeed, who identify themselves more strongly with the land, are reluctant to deploy any of their meager earnings, sell any of their uncertain harvest, to pay school fees. In spite of some shifts towards a democratization of education, there are still biases towards who should, and who should not, have a right to go to school. Indeed, some peasant families, while trying to send some of their children, eventually abandon the task, as, after 8th grade, “higher” education has meant supporting a child or children in the capital, entailing housing needs, or leaning on relatives, favors, or even more expenses. To the extent that they cannot imagine their children competing on such a level, some rural families abandon the task of formal schooling altogether. In our mountain community currently, a year at a primary level at the (heavily supported) Episcopal Church school would cost approximately $55.00 US. Books, uniform are additional costs, and of course, shoes. Students have to wear closed shoes – tennis shoes are acceptable. Throughout the country, each school has its own uniform, with a distinct color, and a solid or checked pattern short, and often requiring matching colored socks. A child is likely to need two uniforms, one to wear while the other is drying. The cost of shoes and uniforms could be another $5.00 to $10.00 US. As one parent (of 9) told me, “Well, if you have several children, you just can’t manage to keep them all in school.” American parents can understand this - it woukld be a challenge here just to keep 9 pairs of feet in shoes, let alone in private school. Uniforms are required in all Haitian schools, and this has served to support a not-insignificant industry within Haiti, for Haiti. In rural Haiti, this has taken the form of cottage industries rather than large factories. Our mountain zone women have expressed interest in sewing uniforms; again, logistics are challenging but not insurmountable. And of course, a student needs at least two uniforms - one to wear while the other is drying. Since the EQ, many children returned to our mountain zone, and are now continuing their schooling – but without uniforms. The uniforms from the city schools don’t meet the regulations in our area – but the schools have agreed not to mandate uniforms this year for these displaced students. An interesting accommodation in the wake of the quake. In our rural mountain zone, the schools do not, cannot, provide a meal for students. This is not simply a matter of funds, it is a matter of logistics, transport, fuel, and storage. Other rural areas, some schools do manage to feed students. Usually, these have sponsors lot bo (overseas, typically, the U.S.) – either individuals or churches or coalitions of churches. In the city, tuition fees are higher – but usually, a meal is included. As mentioned, for working class parents in the city, a big concern was school costs. To enroll, at the start of a year for primary grades, one worker told us will have to pay 800$HD or 100$ US, plus 50$HD/month or $6.25. “For each child,” he adds, “For each one.” So, in the city, a child in school gets a meal every day for $6.25 per month! This may sound cheap to us, but bear in mind that a factory worker's salary is less than $5.00 per day. Other issues in public education in Haiti, beyond the cost of training and implementing, are: curriculum, and of course, language(s) of instruction. Relevance and utility of curriculum are other concerns. In a rural school, 8th grade Natalya sat outside her two room home, which she shared with 7 others. 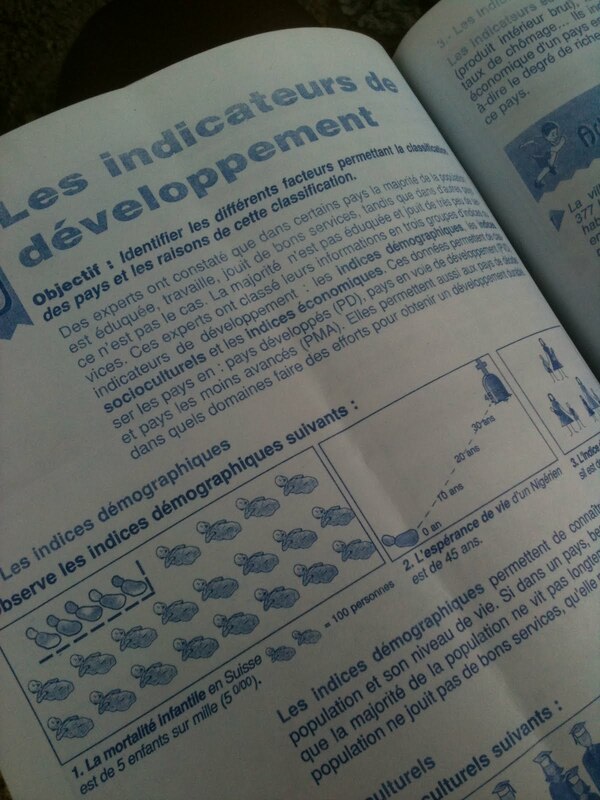 She was studying a page, reproduced below, in a French text, "Indicateurs de developpement." - Indicators of development. Natalya sat outside, head bent over this material, as children played on the dirt floor and a neighbor fiddled with the gift of a solar panel - the communities first and only link to getting some electrical power. Is there anything out of kilter here or is it just me? In the city, the cost of higher education is priced beyond the reach of many qualifying, strong students. Sonia was accepted into one of the country’s better, if not best, medical schools, the University of Notre Dame School of Medicine. The tuition, at approximately $2,000.00 US per year, was something she was not able to pay – even before the EQ. So, she lost her place in the class. Roosevelt wants and needs to take classes in English. He is not working, so he could take the class during the day that are offered at a respected institute downtown. The day time course is much less expensive than the evening class. Still, he is reluctant to ask for even more help from his uncle, mon Oncle en Amerique. With all these limitations, and limitations of access, Haitians who lack formal education have consistently impressed me through the past almost 10 years’ experience in Haiti as being innovators, problem-solvers, and resourceful – as well as intelligent and articulate. People – children as well as adults – construct things, make baskets, buy and sell, build homes, draw lines, measure quantities, cook and serve and generally run their lives, albeit on a shoestring, admirably. Knowledge, wisdom are handed down in an oral tradition, song, church experience, apprenticeships, in and outside of natal families. True enough in Haiti. But not enough for Haiti’s eventual emergence from the 18th to the 21st century. There are answers to the problem of universal, public education in Haiti. And the answers lie within Haiti - no need to look outside. Coming up in next post of Haiti Next Door. Very interesting. Though the people in the study didn't list education as a priority, probably because of their present situation, a year after the EQ. But in the back of their minds if they could afford it, and had good jobs, shelter, food, school would be on their list for their children. Basic needs always come first. As for uniforms, mostly private and Catholic schools wear uniforms in the US. Some public school are strict and will send a child home without a uniform. Most public schools that have tried it give up. My youngest grandson attended an elementary school that required uniforms. He and a few others in the class wore them daily. Mostly be cause my daughter had invested in three and she wasn't letting her money go down the drain. Now internationally, uniforms are pretty much a must. The country doesn't care how poor you are. If you can't afford one and you want to go to school, look for a kid who has outgrown theirs. In the book about the 12 yr old Malawi boy who brought electricity to his village, he had to stop school because he had outgrown his uniform. But he went to the library, got a book on electricity, and proceeded for 3 years to make electricity. He was called a fool even by his family. Yet he lit the house one day and the whole village celebrated. He walked all over getting scraps until he made a windmill to give electricity to the whole village. All without a uniform and school. Mark Twain would understand this child. Think of the minds we're wasting because they don't have uniforms. In the US I think uniforms are good because US parents are stupid enough to buy $1-200.00 dollars on a pair of shoes or clothes for a growing child or for a child period. A $35.00 coat will keep you just as warm and Goodwill will sell clothes for meer dollars.Kids even fight about clothes in the US. We were very poor when I was a child going to school. But my mom was a seamstress. So we were the well dressed poor in our classes. My cousins mom was also a seamstress so we hung together looking good all week but standing in the welfare line on Saturdays with everybody else. Leave the uniform for those who can afford them. Every child has a mind that should not be wasted because of material. The uniforms have importance - wearing one, one has status as a "schooled child," as distinct from the unschooled. More importantly, the making of uniforms - sewing and selling - is among the industries that Haiti has and that Haiti supports. It is good to keep that going. Supporting sewing work provides JOS and income for families who can then CHOOSE to spend money on education - or not. Important to create opportunities and CHOICE, rather than impose standards, or anything else. My 2 goudes for today.